Inni waz jahtu wajahi ya lillazi fa ta rassamawati wal arz hanifauv wa ma ana minal mushriqi na in na salaati wa nusuki wa mahya ya wa mamaati lillahi rabbil aalmin. La shariq lahu wa bizali ka uriratu wa ana minal muslimin. Allahumma ma la ka wa min ka bismillahi Allahu Akbar. Place the animal of Qurbani on the left side in such a way that its’ face is towards the Qibla and put the left leg on its side. And say the above duaa before slaughtering. And the owned possessions are more than the hajate asalia [explained in Masala 2]. Masala 2: Hajate asalia, that is, the things which are necessary to for a livelihood. Possessions of these things does not make Qurbani nor Zakat wajib. Like the house to live in, the clothes to wear in the summer and winter, possessions the household, animals or cars for transportation, equipment for work, and books for the people of knowledge. Masala 3: By books it is meant the Quran, Hadith, Usool of Hadith, Usool of Fiqh, Ilm Kalaam, Akhlaq, and other religious books. Just like this, books of medicine are hajate asalia for a doctor. Masala 4: Besides this, more than copy of books such as religious books, Nahw, Sarf, Nujoom, Stories, Deewan, and other books are not hajate asalia. If their value reaches nisab then Qurbani is wajib. Masala 5: Quran Majeed is not hajate asalia for a Hafiz. Masala 6: Qurbani is not wajib on a musafir (traveler) even if he is wealthy. Although, if he wishes to do Qurbani for Nafl reward then he may do so. Masala 7: If a woman has jewelry given to her by her father or any other possessions which she owns which reaches the value of nisab then Qurbani is wajib on her also. This is the order of every year. Masala 9: If malikun nisaab person does Qurbani in someone else’s name besides himself and not in his name then he is a grave sinner. So, if one wants to Qurbani for someone else then he should make arrangements for another Qurbani for the other person. Masala 10: Male or female camel, cow, buffalo, goat, sheep, and ram are all permissible. 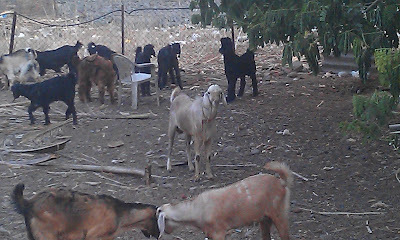 Masala 11: A camel must of 5 years, a cow and buffalo of 2 years, a goat, sheep, and ram of 1 year. If the animal is younger than this then qurbani is not permissible, if older than this then it is permissible, in fact it is better. However, if the six-month old offspring of sheep or ram is so big that from looking from afar the sheep or ram looks like a year old then it is permissible. Masala 12: It is wajib for a sahibun nisaab to slaughter one goat or to slaughter a seventh of camel, cow, and buffalo, it is not permissible to slaughter less than one seventh of the animal. Masala 13: To slaughter more than a seventh is permissible such as five or six persons slaughtering a cow or buffalo, rather, one person may do qurbani of a whole cow. Masala 14: The time for Qurbani is from the dusk of dawn on the 10th of Zul Hijjah to the sunset of the 12th of Zul Hijjah, that is, two days and three nights. Masala 15: The best date for Qurbani is the 10th of Zul Hijjah, then 11th, and then the 12th. Masala 16: It is not Jaiz (permissible) to do Qurbani before the Salah of Eid in the city. 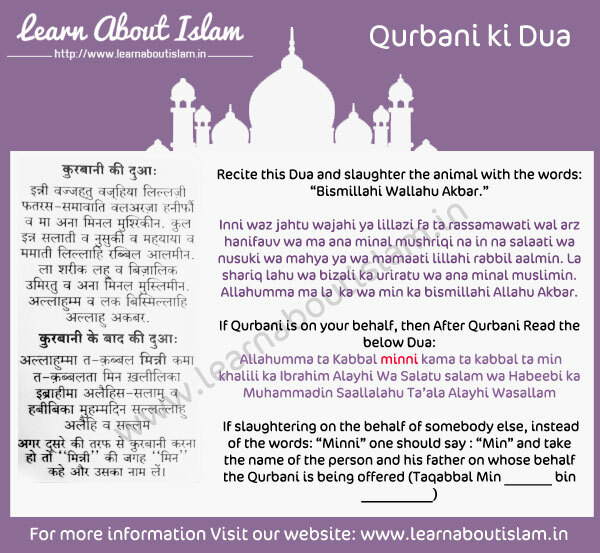 Masala 17: One may eat the meat of Qurbani himself or give it to a poor or wealthy person or feed them, rather, it is mustahab (better) that the one who has done the Qurbani also eats some from the Qurabni. Masala 18: It is best for the one who will do Qurbani that to not eat or drink anything from dusk of dawn on the 10th of Zul Hijjah and when the Qurbani is done, he eat from it’s meat. Masala 19: It is better to divide the meat into three parts in such a way that one for the Fuqaraa and Masakeen (the poor and needy), one part for the friends and relatives, and one part for his own household. If the household persons are many then he my feed all of the meat to his household. Masala 20: If one did Qurbani on behalf of a deceased person then he may eat the meat himself and feed it to his friends and relatives, that is, if the deceased had not made waseeah (willed) this Qurbani otherwise give all in Sadqa. Masala 21: If the Qurbani is done because of a mannat (vow) then one can not eat the meat himself nor can he feed to the wealthy rather it is wajib to give it in Sadqa, the vower my be a wealthy or poor person. Masala 22: It is not permissible to give the meat to a Kafir. Masala 23: It is not permissible to give the leather or meat or any part of it to the butcher or to the one who did the slaughter (for you) as a payment. Masala 24: It is not permissible to sell the leather/skin of the Qurbani and bring the money into personal use. However, one may use the leather/skin for personal use. Masala 25: Many people give the skin to religious Madarsas which is a afdal(best) and the means of getting great reward. At times, it is difficult to send the skin to the madarsas so people sell the skin and send the money to the madarsas which is also no problem. Masala 26: Four arteries are to be cut whilst slaughtering. If three of the four arteries are cut or most of the each four arteries are cut then the slaughtered is Halal. Masala 28: If one handed over the animal to the butcher before completely slaughtering the animal then the butcher must also say Arabic text before proceeding with slaughtering the animal. Masala 29: To slaughter in such a way that the knife reaches the haraam magz (spinal cord ) or that the head comes off is makrooh (undesirable) but the animal can be eaten, that is, the undesirability is with this action not with the zabeeha (slaughter). Masala 30: The same order applies for a woman as does for a man, that is, the slaughter of a woman (performed by a woman) is permissible. Masala 31: The slaughter of a Mushrik or Murtad (performed by them) is dead and haraam. People who are interested in taking the journey of Hajj this year can avail the opportunity through Low Cost Hajj Packages by road to Makkah. Sab se pehle apne naam se qurbani karni jaruri hain. Jis par qurbani wajib hai tho uspe qurbani jaruri hai. Uske baad isale sawab ke liye qurbani kar sakte hain. Agar Marhoom ne koi wasiyat ki hain tho qurbani ka gosht apne liye istemaal na kare. use gareebo mein taqsim karde. Agar khud isale sawab kar rahe ho tho us gosht ko usi tarha istemal kare jaise aam qurbani kar sakte hai. Aur agar Allah ne aapko maal diya hain tho Huzur sallal lahu alaihi wa salam ke naam se bhi kare.